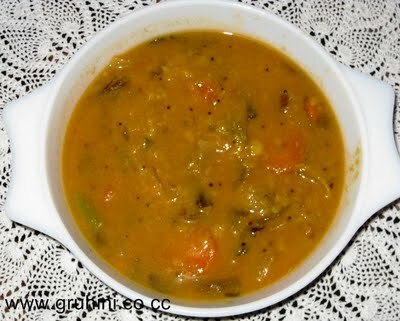 1.Soak toor dal for half an hour and cook in presure cooker and give 4whistles. 2.Soak tamarind in water for half an hour and make pulp. It should be thin and watery. (approximately 4 cups). 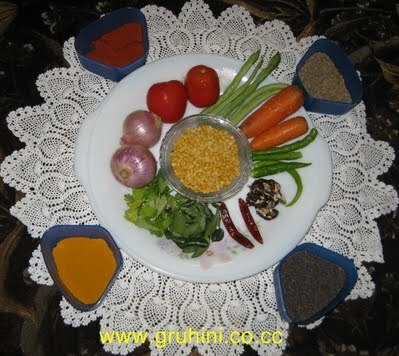 3.In a vessel put all the vegetable pieces and add 2cups of water and cook till vegetables becomes tender. 4.To this add tamarind pulp,cooked dal,curry leaves,green chilli slits, grated coconut,salt,turmeric,chilli powder,,jaggery and cook for 8 to 10 minutes. 5. For tampering heat oil in a pan add red chillie peases,musterd seeds,jeera and hing and let it crackle add it to the vegetable mixture and cook for half a minute and switch off the stove. Pappu charu is ready to serve.Serve with steamed rice.